La Tomatina is a spanish festival held in the Valencian town of Bunol which is located at a distance of 30 km in the east of Spain. 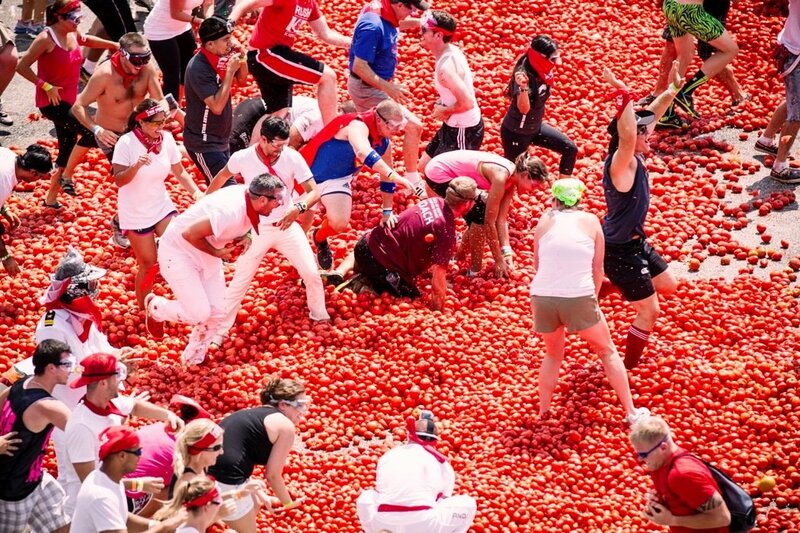 La Tomatina is one of the World’s biggest food fight in which participants throw tomatoes at each other for entertainment purposes. The festival helds on the last Wednesday of August every year. The festival is filled with joy and excitement and participants really enjoy this game. Participants from all over the world came to participated in this festival. In this festival around at 11 am many trucks came with plenty of tomatoes into the centre of the town. The tomatoes bought for the fight are less expensive. This festival is full of fun and excitement for the Spanish people. The tomato fight begins with firing of water and continues for an hour after that that the whole town is covered with the tomato paste.There are some rules associated with this game which everyone has to follow to participate in the festival.The tomatoes have to be squeezed before throwing to dodge injuries.Nothing other than tomatoes are allowed in the festival fight.No tomatoes are to be thrown after the second blast. Keep a safe distance from the trucks. Ticketing rule has been started to limit the number of participants . As the number of participants increases every year. Participants bodies are covered with the tomato paste and tries various ways to remove that from body.some goes to pools and others goes to home. There is no winner of the game.This is only for the tradition and fun.